Lucy Greco wanted to be a physical therapist. She loved the idea of working with athletes, helping them achieve their best possible performances. But a year or so into her university studies, back in the late 1980s, Greco gave up on her dream career. "All the required scientific reading was very difficult," she explained. "Paper journals were all we had then. And as a blind person, that was not something I was going to be able to do." Greco did try every available avenue to make it work, which mostly meant relying on others to help her. 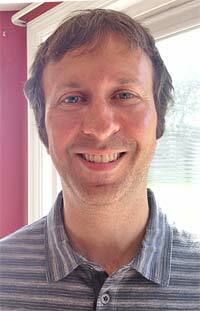 "I remember once a librarian and I sat for eight hours trying to find the journal articles I needed," Greco said. She couldn't see such extreme dependency as a sustainable approach for a career. So Greco switched majors, settling on British literature, a field replete with audiobooks she could access on her own. Still, it took her eight years of full-time study to complete a bachelor's degree. In her current position as web accessibility evangelist (her actual title) for the University of California, Berkeley, Greco helps today's students succeed in STEM disciplines by facilitating inclusive web design. Accessible design, also called inclusive design, is an effort Elsevier leads at international and industry-wide levels as part of the company's commitment to opening the world's libraries for people with auditory, cognitive, physical, speech or visual disabilities. 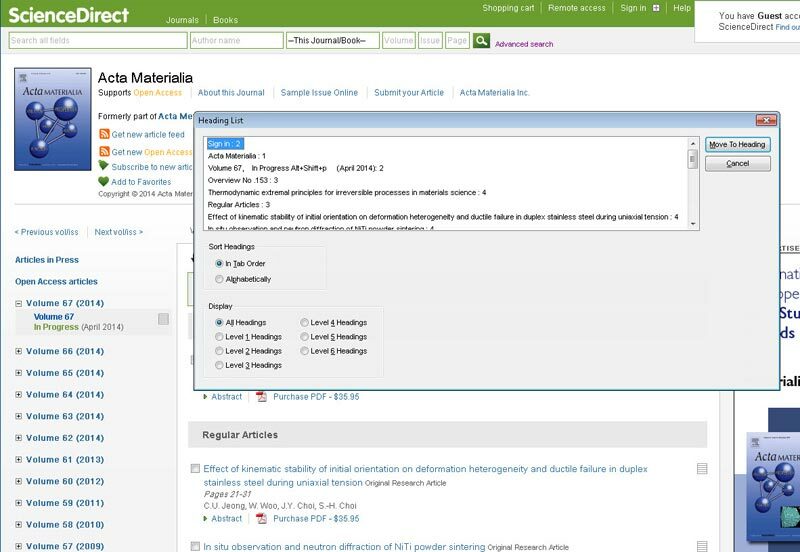 Students and researchers in particular appreciate the unprecedented ability to quickly and easily access books and journal content in Elsevier's ScienceDirect, the world's largest online collection of science, health and technology journals and books. At university, I made choices specifically to avoid research. Now that I have the ability to read those journal articles the same as anyone else, I would not hesitate to do any kind of research today. US law and international guidelines increasingly mandate digital accessibility standards, and a groundswell of interest has reached critical mass. Meanwhile, Elsevier long ago declared its own intentions in the field. "We have a commitment to be sure that what we provide is usable by everybody, and a lot of people here go above and beyond to meet that commitment," said Ted Gies, Principal User Experience Specialist for Elsevier and Accessibility Lead for parent company Reed Elsevier. A champion of web accessibility for more than 10 years, Gies co-authored Elsevier's accessibility policy and led the development of the accessibility policy for Reed Elsevier. He also leads Elsevier's Accessibility Collaboration Group, which includes UC Berkeley's Greco and representatives of eight other academic institutions. These volunteers test ScienceDirect pages for usability, accessibility and compatibility with assistive technology. In Greco's case, her screen reader converts the webpage's source code into a single column of text rendered only in the computer memory. 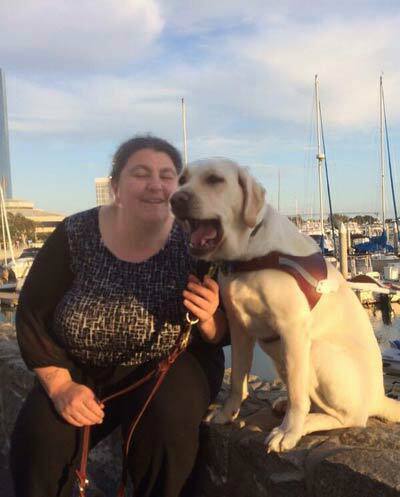 Through various keyboard commands, Greco can then have the part of the content she needs either spoken or sent to a refreshable Braille display. Sequencing of data here is crucial, since the screen reader creates a virtual representation of a page in the linear order of the code. Communicating to a person who is blind how a site is arranged often depends on a thoughtfully designed heading hierarchy. "Thinking about what to present first, second and so on is a very common challenge for website developers designing pages for accessibility," Greco said. "As a screen reader ticks through the source code behind the page, it recognizes heading levels. So I can move through a page header by header." Problems crop up when those headers are presented out of order. Users can't know if the page design is off or if they've missed critical information. "If I'm reading along, and the header formats jump from H1 to H4," Greco explains, "it makes me ask, 'Where are my H2s and H3s?'" Gies still recalls the personal impact of his own introduction to the field of web accessibility. It happened during a routine usability study as he first watched a person who was blind attempt to access online resources. He was stunned by the barriers the user encountered, from illegible text to clumsy descriptions of illustrations to wimpy software that all too frequently crashed under the weight of heavy data loads. "I learned a heck of a lot from that," he said. "It made me want to try even harder to make our sites accessible." Today, Gies is quick to address false impressions surrounding the fundamentals of providing accessibility in publishing. There's still a misconception that this is some minor thing one or two blind people might care about. What I came to find out early on was that there are many users who benefit from accessibility. Also, often for us, as providers of scholarly information, accessibility isn't just a matter of numbers of people; it's a contractual requirement. Many of Elsevier's customers must comply with a growing body of laws, regulations and policies developed to expand online access for all. Universities participating in federally funded research or academic programs, for instance, must make certain that both physical and digital campus spaces are accessible. Consequently, the vendors they use must provide compatible products and services. We significantly reduced the number of links on Search Results and Journal Home Pages, making it easier for a screen reader user to load and navigate page, and easier to understand content. There was a 78 percent reduction of links on Search Results and a 54 percent reduction of links on Journal Home Page. The article list is now much easier to navigate with a screen reader. JAWS users can simply hit "H" key to jump between titles in result list. Search Results and Journal Home Page now have "ARIA landmarks," allowing for screen reader users to bring up a list of main page regions. This helps users understand page composition and allows skipping to main areas, e.g., "Articles"
Generic, repetitive links such as "Abstract" and "View Preview" now are announced by screen readers in the context of the parent article title. 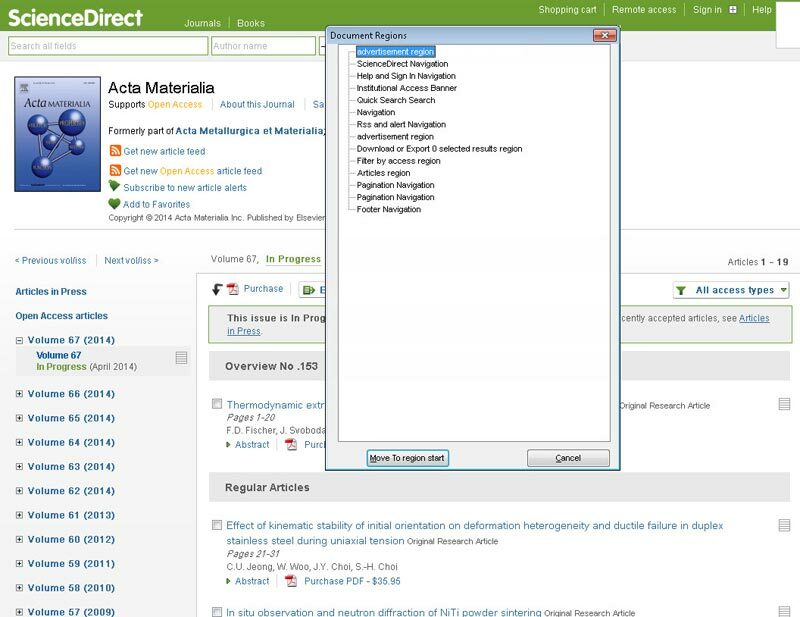 See How a screen reader works on ScienceDirect. "This topic of accessibility is expanding, so companies like ours are going to be working hard to alleviate any customer concern for being sued or being denied funding from grants," Gies said. Other lingering obstacles to online inclusivity include concerns about the extra expense of developing accessible web pages and possible negative impacts on site design. But Gies dismisses concerns that a site can't be "both accessible and good-looking" as "another misconception." In fact, he'd like to shift the whole conversation. As he sees it, publishers and developers should see web accessibility not as a pesky compliance issue but as an overall asset. "When you really get into this subject," he said, "what you realize is that anything you do to enhance accessibility is just good usability." Making sure everything works keyboard-only, for instance, benefits a broad population of people Gies calls "power users," whose work lends itself to key strokes more than mouse motion. Similarly, properly worded titles, heads and subheads that enable screen readers to find and organize online material for vision-impaired users, offer the added benefit of making those websites easier to bookmark. Perhaps the biggest generic advantage of online inclusivity, according to Gies, is that pretty much any type of accessibility enhances searchability. And what online publisher, whether established corporation or newbie blogger, doesn't fret about search engine optimization (SEO)? In the accessibility community, people talk about Google as the biggest blind user in the world because its search engines can only index all the bits of text and metadata on websites. Google knows where page headings are, even though it has no idea of a site's visual layout and doesn't understand any information that is purely graphical. In fact, he added, most of Google's suggested best practices for webmasters to enhance SEO are also accessibility guidelines. Just as physical accessibility has become an expected practice in our everyday world—from wheelchair ramps to Braille signage to assistive listening devices — Gies, Greco and their fellow web accessibility evangelists believe online inclusivity is trending toward the norm. "Accessibility will continue to become ubiquitous," Gies said. "That's the big thing for people to know." "It's not an expensive proposition," he stresses. "Most of the things that make your site accessible are quick and easy additions that don't require a lot of programming, and you get a lot of bang for your buck — a big ROI." Gies cites the almighty iPhone as a stellar case study showing what's possible from proactive adoption of accessibility features. Apple did something very smart. They put a very capable screen reader, VoiceOver, into the iPhone. The VoiceOver program announces whatever you're touching. Nobody required that in the iPhone operating system; Apple just did it because they knew it was an opportunity to set their product apart. Fast forward to now, and they're taking sales away from other screen reader companies. The Apple system (iOS) is the preferred handheld and tablet for people who are blind because it's got such a great screen reader. Apple's foresight has paid off big time. So has Elsevier's dedication to online accessibility for users like Lucy Greco, who stand at the threshold of a thrilling new horizon as technology opens more and more of the world's knowledge to all. Previously it required hours and hours of coordination, including finding people to help me, before I could actually read a research journal article. But that day, in a matter of seconds, I was able to find 21 articles on my eye condition that I'd never had access to before. It was one of the most exciting moments of my life. 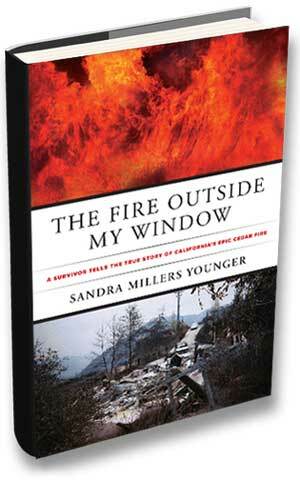 Journalist Sandra Millers Younger is the author of The Fire Outside My Window: A Survivor Tells the True Story of California's Epic Cedar Fire — a first-person, nonfiction account of the biggest wildfire recorded in California history. (You can read about it in Elsevier Connect.) She has written or edited hundreds of published articles for publications ranging from academic journals to Seventeen Magazine. 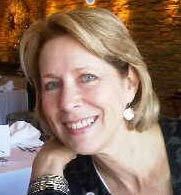 She is also founder and chief story strategist at Strategic Story Solutions.